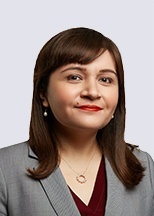 Cristina Almendarez is an intellectual property attorney who focuses her practice on patent infringement and trademark litigation covering a range of technology, products, and industries. Her experience includes representing clients across a range of products and technologies, including biologic and pharmaceutical drugs, consumer goods, lithium-ion batteries, medical devices, and food processing and packaging machinery. Cristina has worked on issues across various phases of litigation, including pre-suit analysis and strategy, discovery and depositions, claim construction, summary judgment, and appeal. Her past work also includes coordination between parallel district court litigation and USPTO inter partes review proceedings. Represents named inventors of an extensive cardiac stent patent portfolio in litigation in federal court regarding breach of contract for royalties. The case is being litigated similar to a patent infringement case including the exchange of infringement and invalidity contentions, and involves a parallel inter partes review proceeding. Represented Hospira, Inc., a subsidiary of Pfizer, Inc., Celltrion, Inc. and Celltrion Healthcare Co., Ltd. adverse to Janssen Biotech, Inc. in litigation in federal court related to a biosimilar version of Janssen’s multi-billion dollar drug Remicade®. The case involved the first biosimilar monoclonal antibody to be approved by the FDA, and is one of the earliest cases filed under the Biologics Price Competition and Innovation Act (BPCIA). Assisted with appeals of two highly publicized motions for summary judgment that invalidated Janssen’s patent related to the infliximab antibody. The district court litigation ended with second win in the form of a judgment of non-infringement related to the second patent asserted in the case.